The Boulton Paul Defiant had its main weaponry in a turret behind the pilot. In 1935, the idea of such a design for a fighter plane was still acceptable, though the armament of the Boulton Paul Defiant was soon to be overtaken by the forward facing weaponry carried by both the Hurricane and Spitfire. The idea of placing the main weaponry of a fighter behind the pilot had first been espoused in 1935 - there were those who were supporters of the ‘power-operated multi-gun turret’. This idea had the advantage of allowing the pilot of the plane to fly the plane and leave the defense of the plane to the person who was in the multi-gun turret. This person also had the task of being the plane’s offensive officer. The Boulton Paul Defiant first flew in August 1937. Its turret, though it contained awesome weaponry, was also responsible for increasing the drag factor of the plane which had an impact on the plane’s speed. Not alone in the idea of a 'turreted' fighter, the Blackburn Roc was also similarly equipped for the FAA. Its success was similar to the Defiant and it was quickly withdrawn from service after combat laid bare the general weakness of the design. The Boulton Paul Defiant had a significant success in the German attacks leading up to the evacuation at Dunkirk. The sheer fire power of the Defiant took the Luftwaffe by surprise and by May 1940, the Defiant had shot down 65 German planes. However, the Luftwaffe soon learned that a Defiant attacked head on was an easy target and by August 1940 they were withdrawn from military daylight operations. The Defiant carried on as a night fighter. In the aftermath of the attack on France, the Defiant was fitted with the A1 radar and in the winter of 1940 to 1941, the Defiant recorded more kills than any other night fighter plane. But as a daytime fighter it was simply outclassed and as fighter plane design developed, the Boulton Paul Defiant was simply overtaken. Those remaining Defiants were converted to target tugs or used for Air Sea Rescue aircraft. In such roles, they soldiered on for the rest of the war. The molding itself is first rate with superb detailing. The parts will all need some clean-up on the edges and openings. It is just the nature of the beast. The actual plastic is identical in the two kits with the exception of the forward en gine cowling. The NF.II has a deeper oil cooler and generally has a larger radiator as well. The other differences are that the NF.II has different exhaust and a different prop/spinner from the Mk.I. All the other bits save the engine cowling parts are provided in both kits. Though care has been taken with the mold, I did find that the rudders had sink areas in them. This won't be simple to fix as there is detailing that will be erased in filling them. It is due to the thickness of the plastic and is something that short run kits run into from time to time. It was evident in both kits. Resin is used rather extensively in the kit for the turret and guns, interior parts, and the wheel wells, just to name the more important ones. For the NF.II, photoetched parts are the belts and harnesses and the various dipole antennas for the wings and the fuselage side. The instructions are well done with a good history of the type, a parts diagram, color info with FS 595 colors where needed, and eleven construction steps. These instructions are the same in both kits with the various bits for the Mk.I and NF.II clearly delineated so there will be no errors. Throughout the construction is a warning to be sure to dry-fit and check alignment of all parts during assembly. Sage advice indeed and the builder really needs to heed it to get the best results. Decals are superbly printed by Microscale so you know that the quality is there. For the Mk.I, all aircraft are in a disruptive camouflage scheme. The aircraft of 141 Sq and 307 Sq are in Dark Green/Dark Earth uppers. The 141 Sq plane (the one on the box art) has a Sky underside. The 307 Sq aircraft has the left underside in black and the right in white. The third Mk.I is from 276 (ASR) Sq and in FAA colors of Extra Dark Sea Grey/Dark Slate Grey over Sky. For the Mk.II nightfighter, both are in matte black overall. The units on the sheet are 125 Sq (the box art plane) and a very similar151 Sq aircraft. You are provided with two sheets per kit. 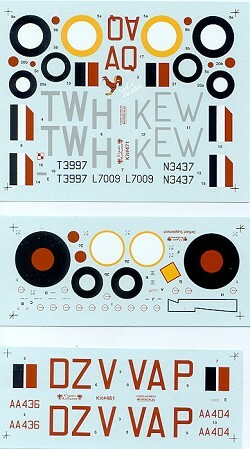 One is a generic roundel/data sheet with the specific unit markings and alternate roundels on the separate kit sheet. 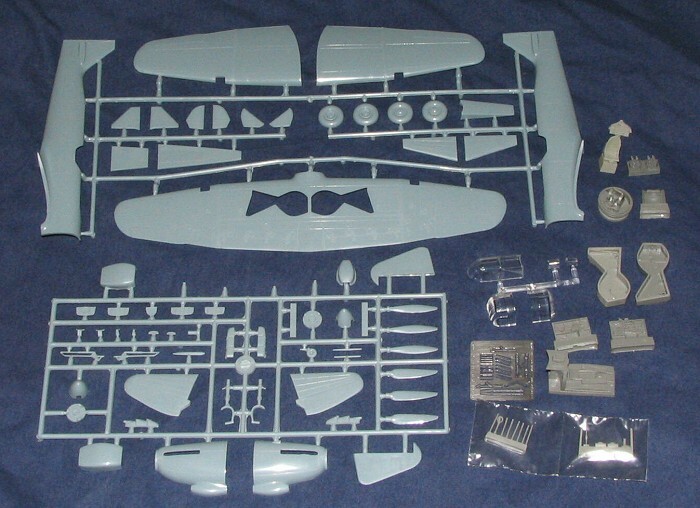 The generic sheet is the one in the middle with the Mk.I atop and the Mk.II on the bottom. The earlier Defiant kit sold extremely well and there is not any reason to think that this one won't be equally as popular. It has all you'd want in a kit of this type. Probably the only thing that one could want would be optional canopies so that the aircraft could be shown with the turret 'in action'. When the turret powered up the aft of the canopy and the rear decking dropped down so as not to interfere with the guns. The kit has the read decking separate and tells you to fix it in the more normal 'up' position, typical of the aircraft at rest. Most modelers should have no trouble modifying the rear decking by gluing it 'flat'. The canopy area will take a bit more work. 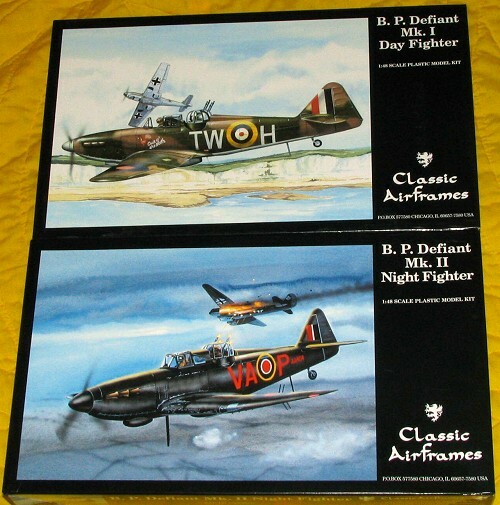 Regardless of which version you get, you'll be getting the best 1/48 Defiant that there is. Coming soon will be a Target Tug version so that will be worth looking for. Review kits courtesy of Thanks for your support.